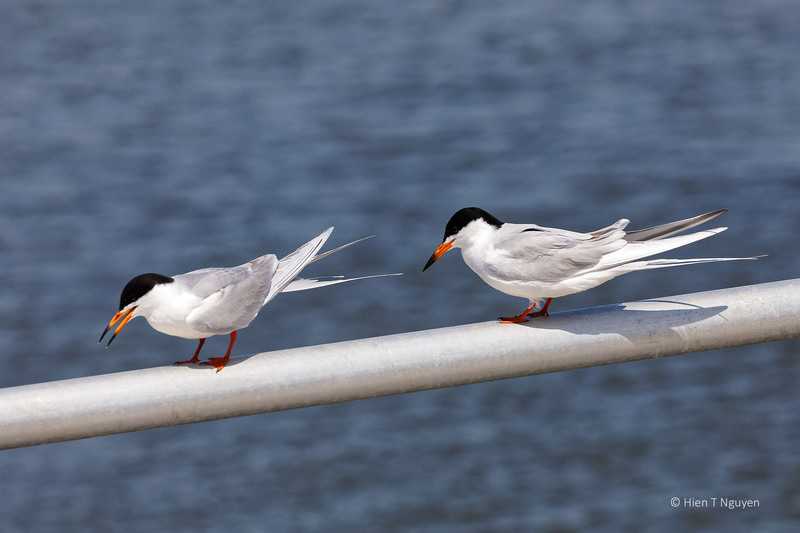 Two weeks ago I saw immature Forster’s Terns at the refuge. 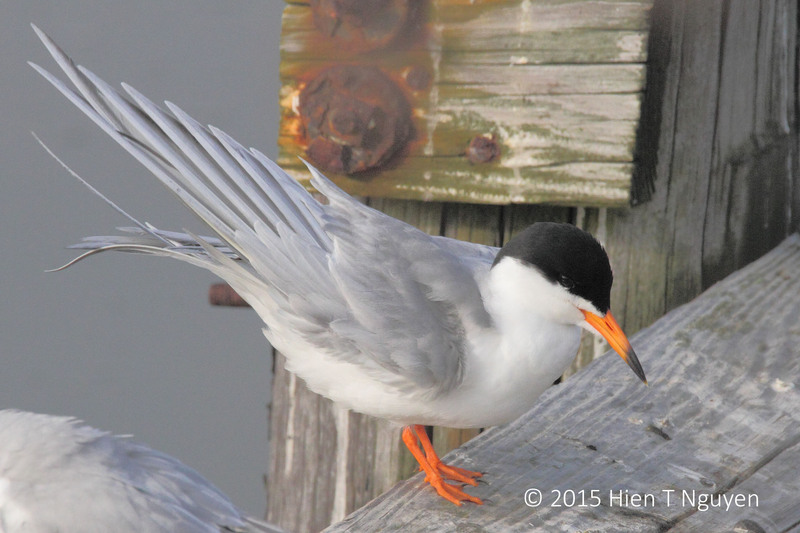 They were as active as their parents, and a little noisier. 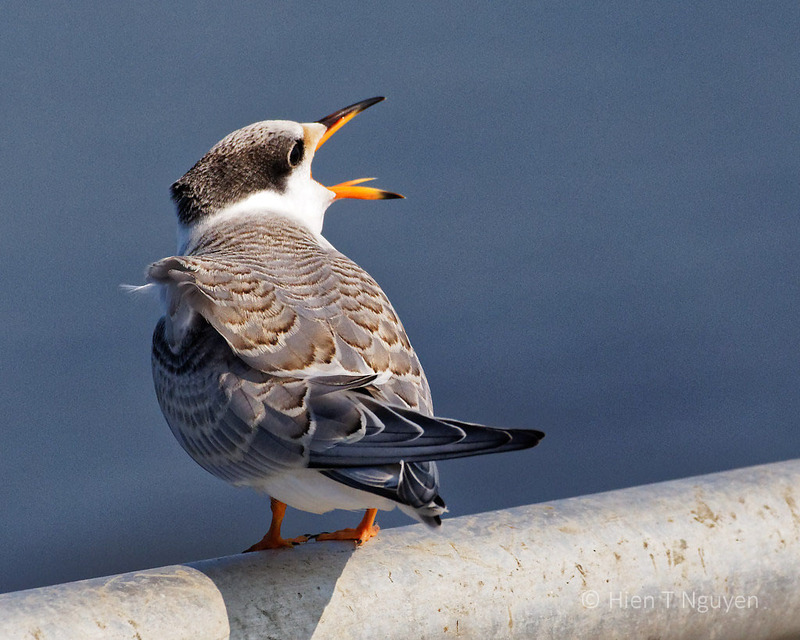 While the parents look well traveled and perhaps a little worn out, the younger ones still have some baby fat and show a lot of spunkiness. 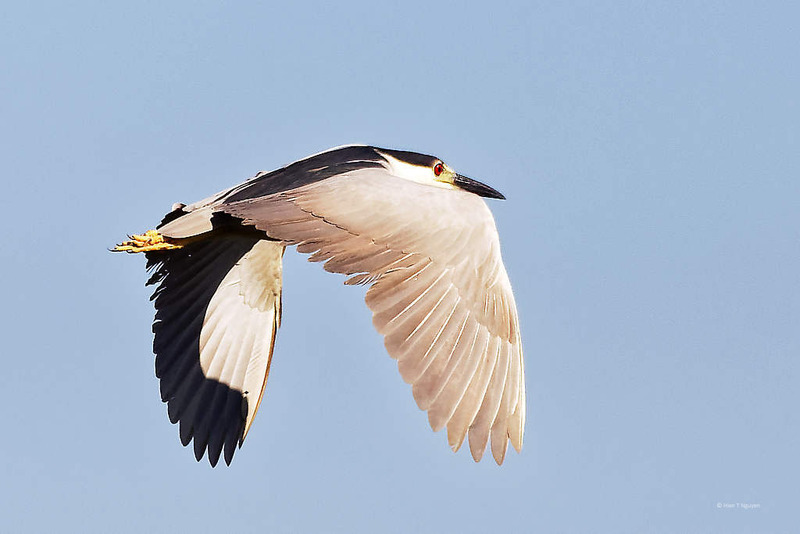 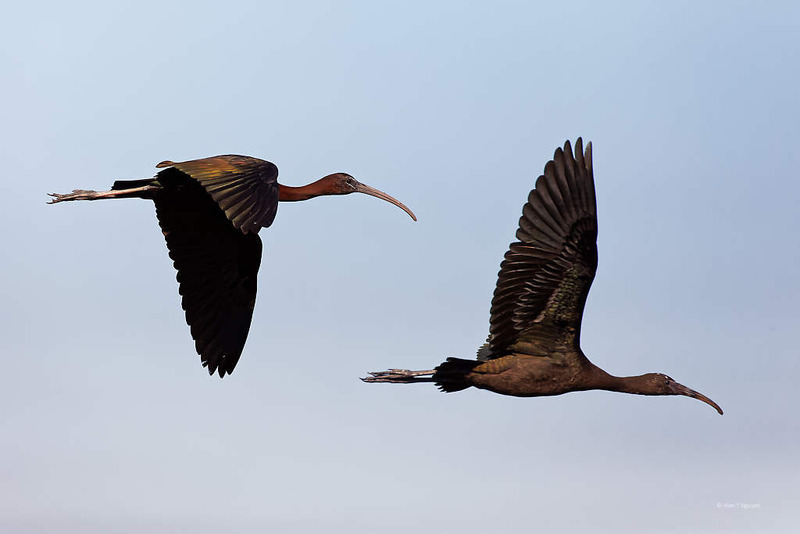 True to their species, they are great fliers and hunters. 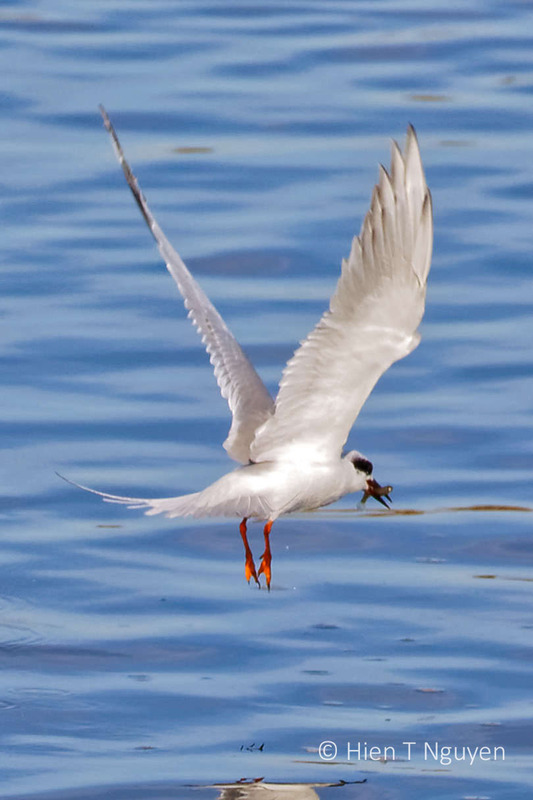 Even when they don’t catch anything. 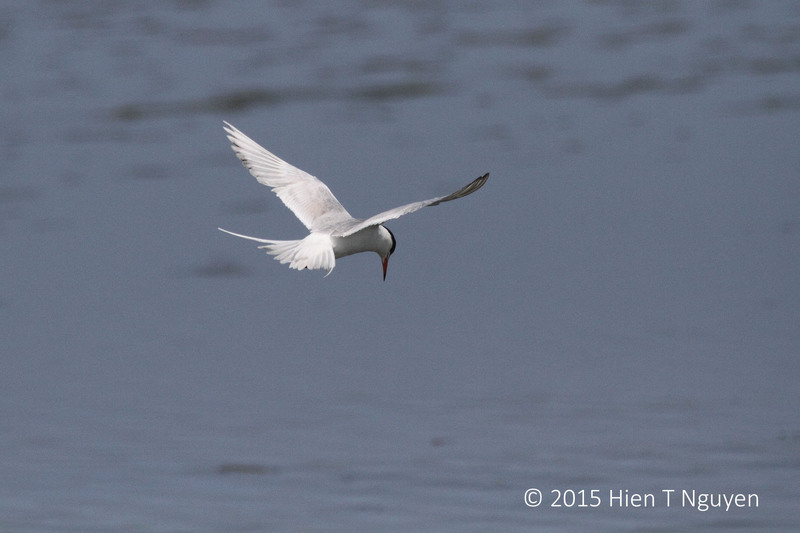 Immature Forster’s Tern coming out of a dive. 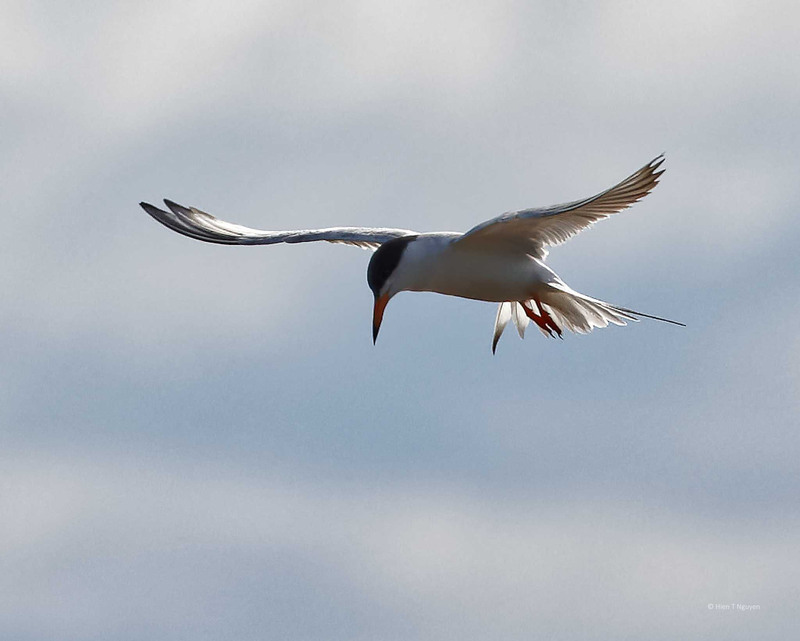 Forster’s Terns have impressive sky diving skills when they hunt for fish, and I have been trying to capture them doing aerial acrobatics in photos. 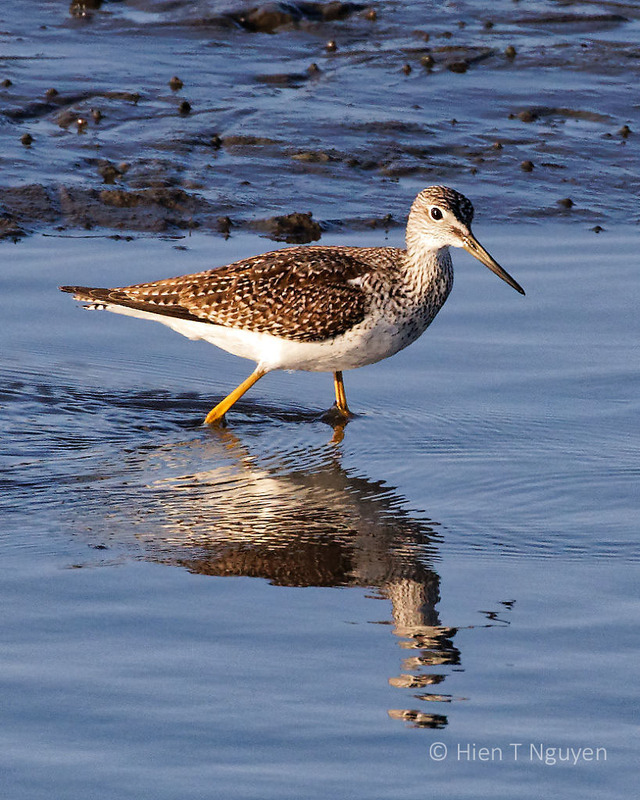 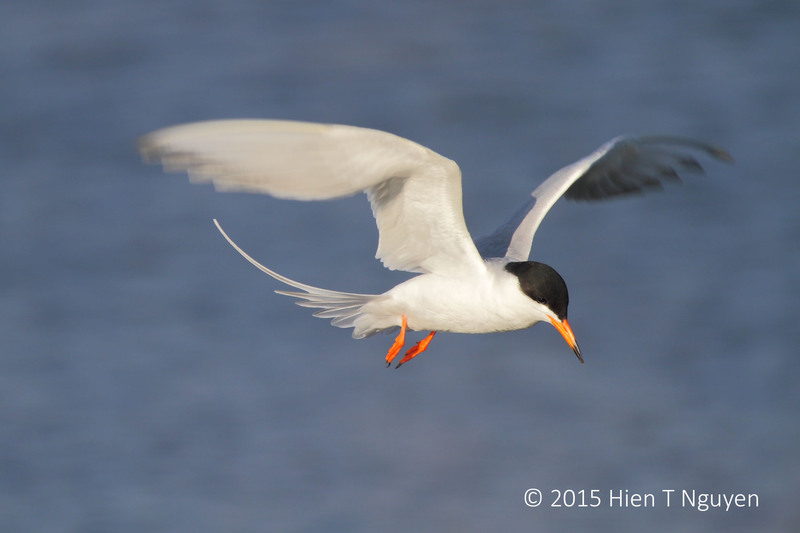 Yesterday’s several of them put on a fantastic show at the refuge under a sunny sky. 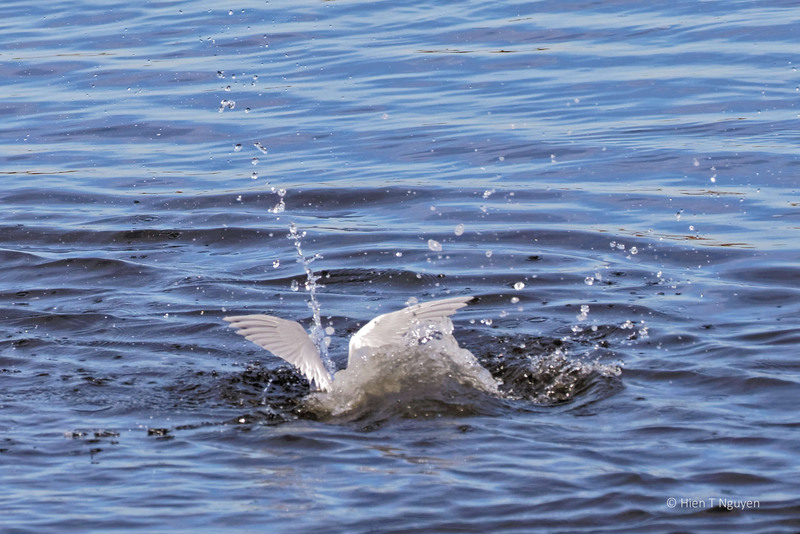 Forster’s Tern diving straight into water. 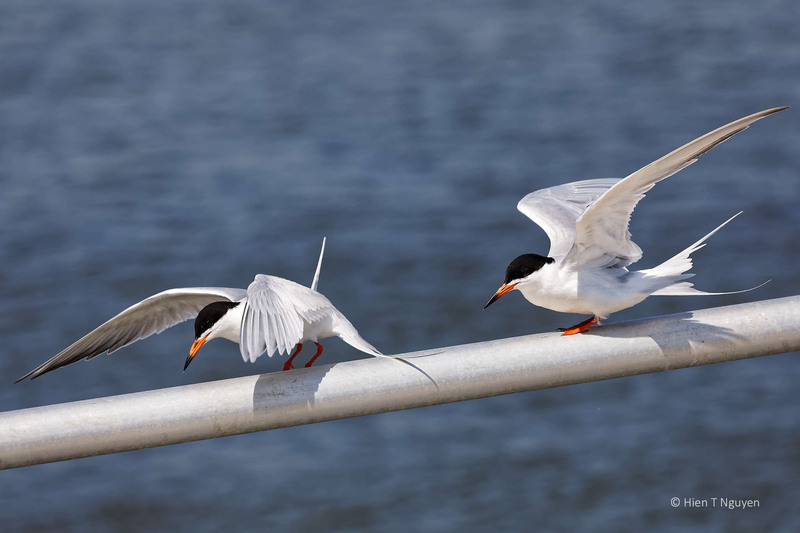 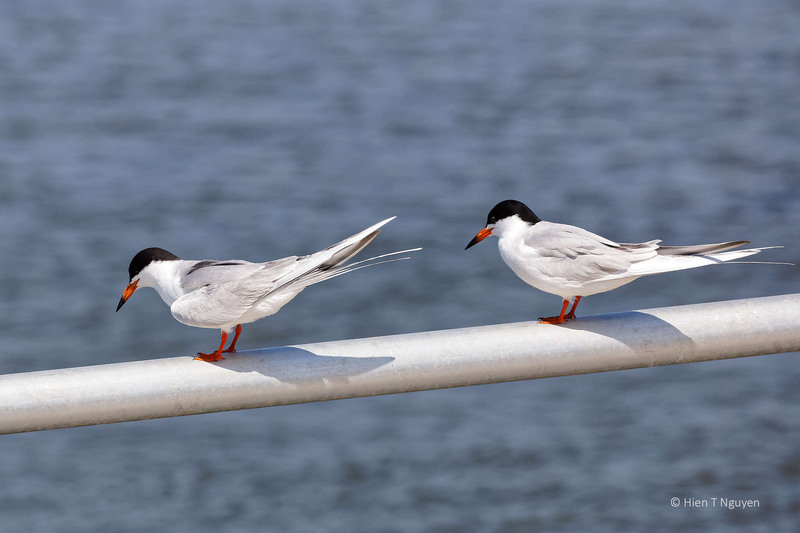 The following pair of Forster’s Terns were unconcerned by my presence as I parked close to the guardrail where they were perched. 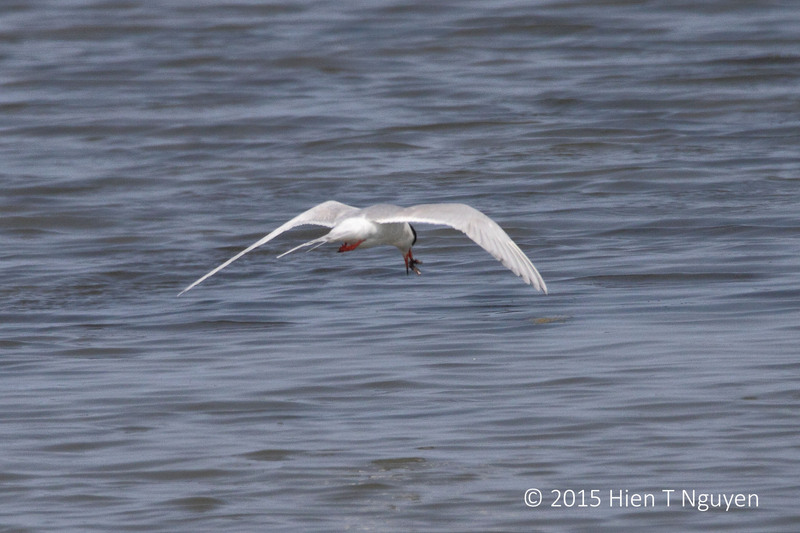 They seemed busy deciding when to plunge into the marsh water to look for fish. 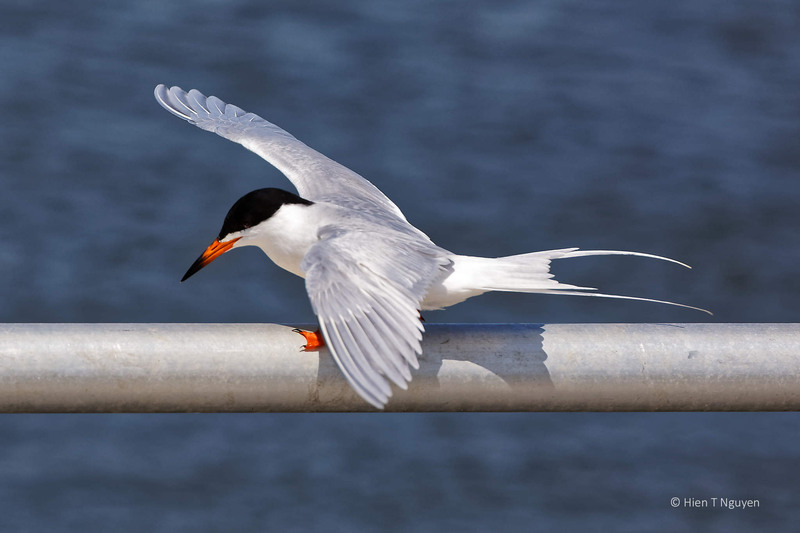 Forster’s Tern hovered before coming back to the guardrail. 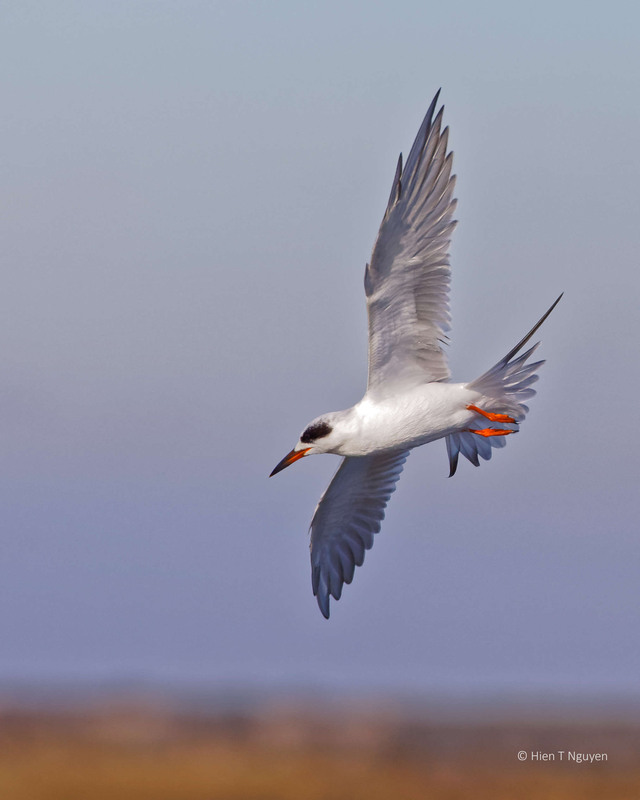 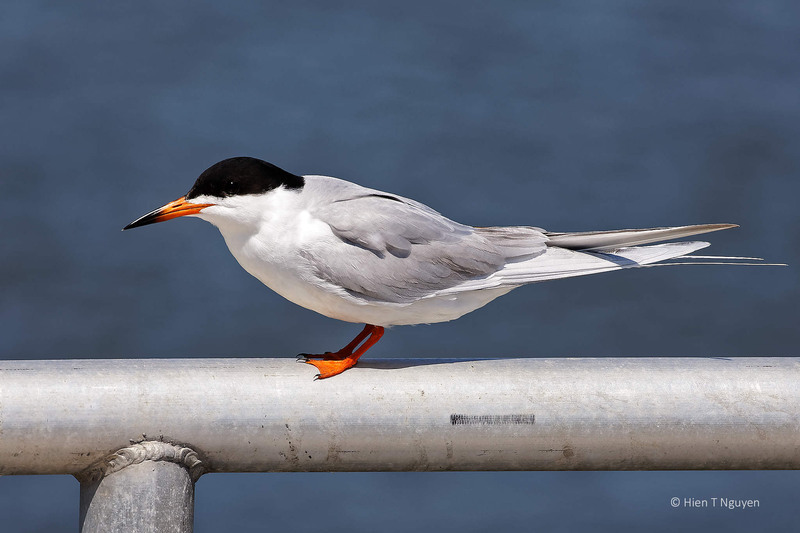 Once the fog had completely dissipated, Forster’s Terns came out and again earned their reputation as ace flyers and divers. 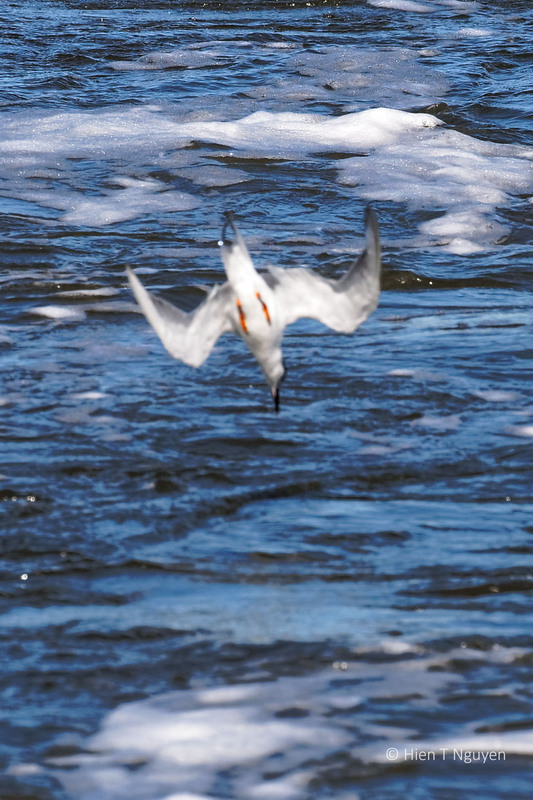 I had my camera set to capture them at 1/3000 sec, but even that was barely enough to freeze their motion in mid air, especially during their almost vertical dives. 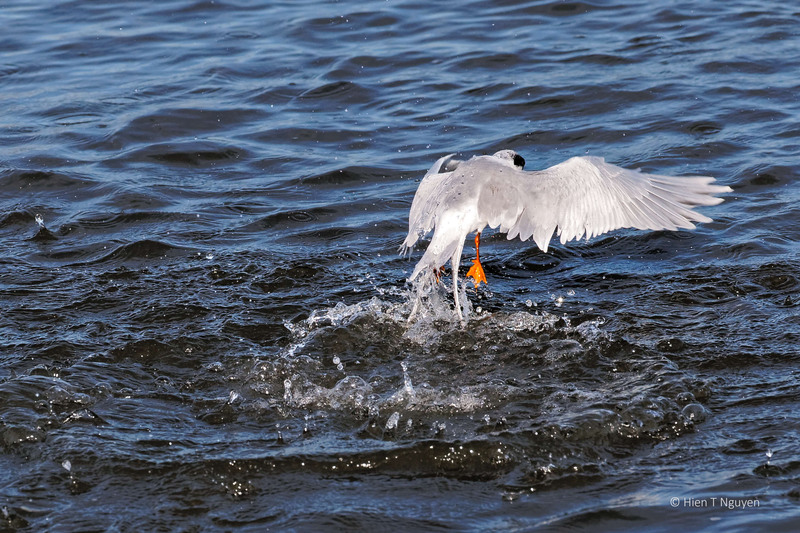 Forster’s Tern diving into water. 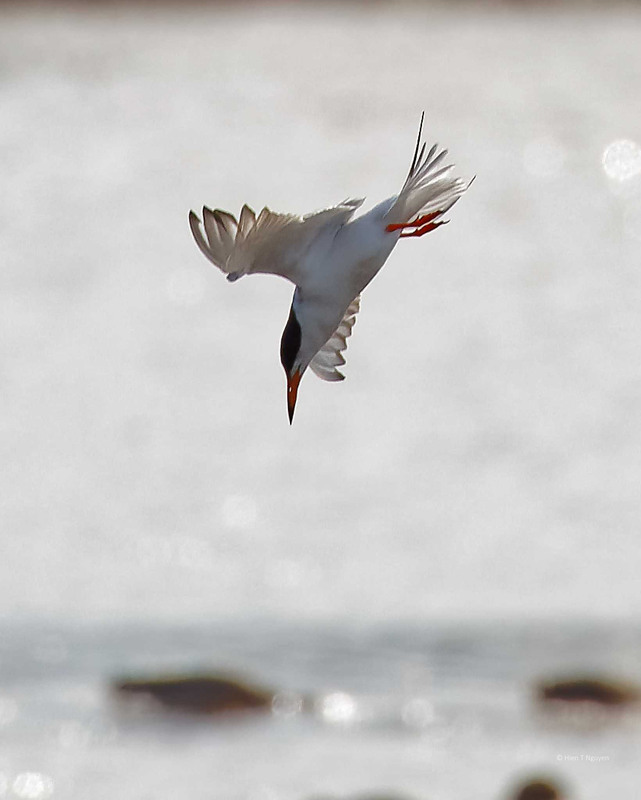 Forster’s Tern pulling out of dive. 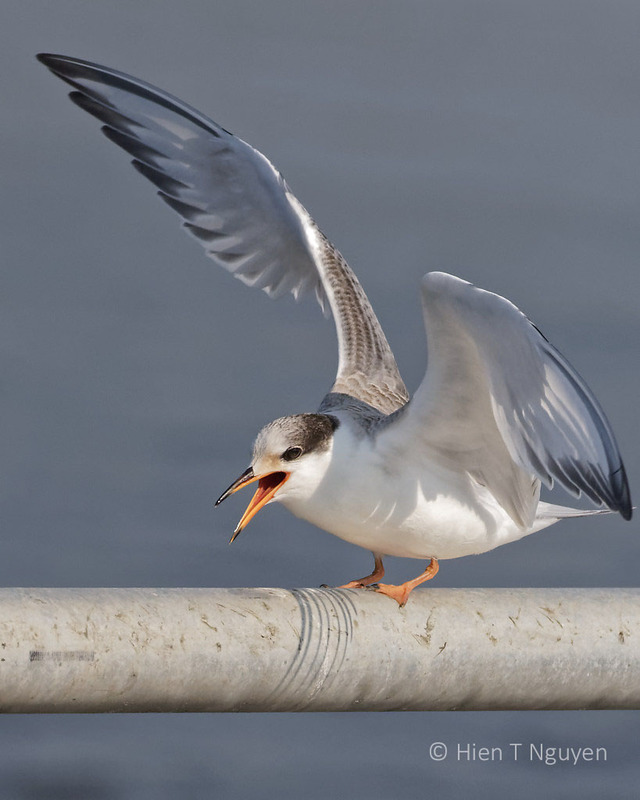 Finally I was able to catch one of these birds with a fish it had just caught. 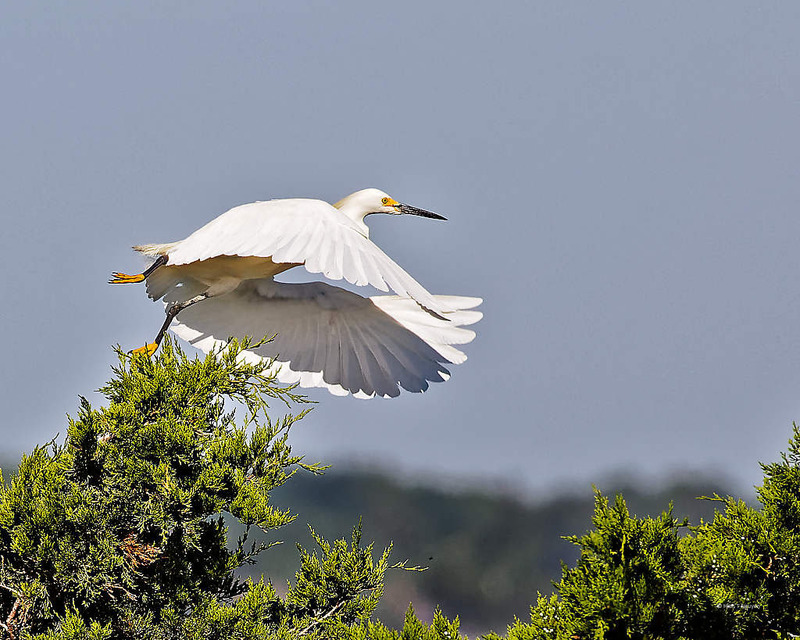 On a drive on Wildlife Drive at Edwin B Forsythe National Wildlife Refuge, I kept hearing splash sounds in the ponds on either side of the drive. 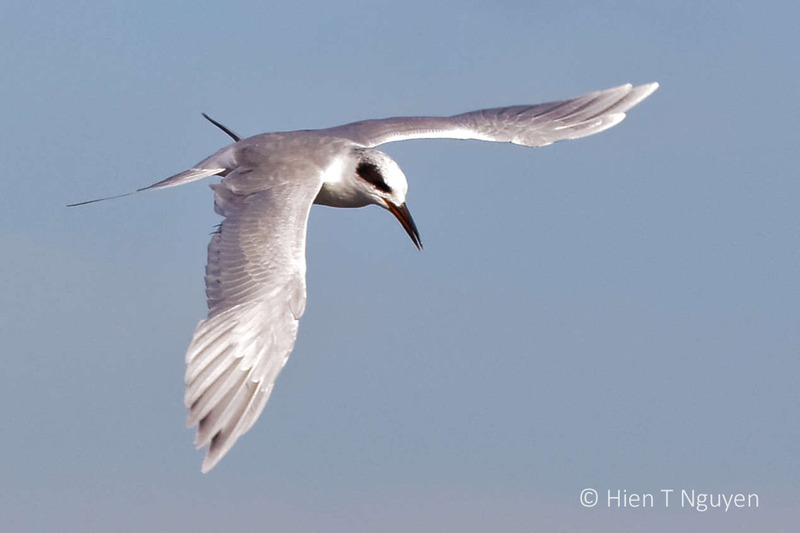 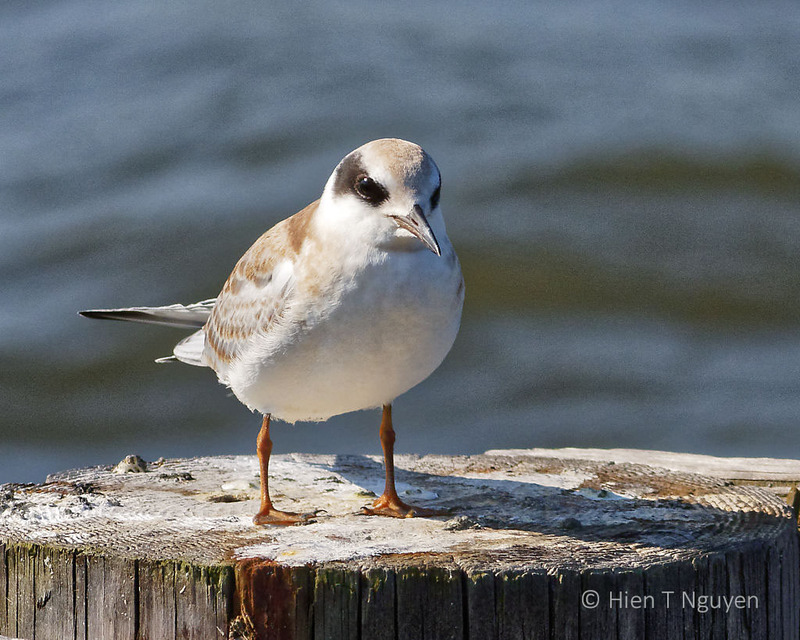 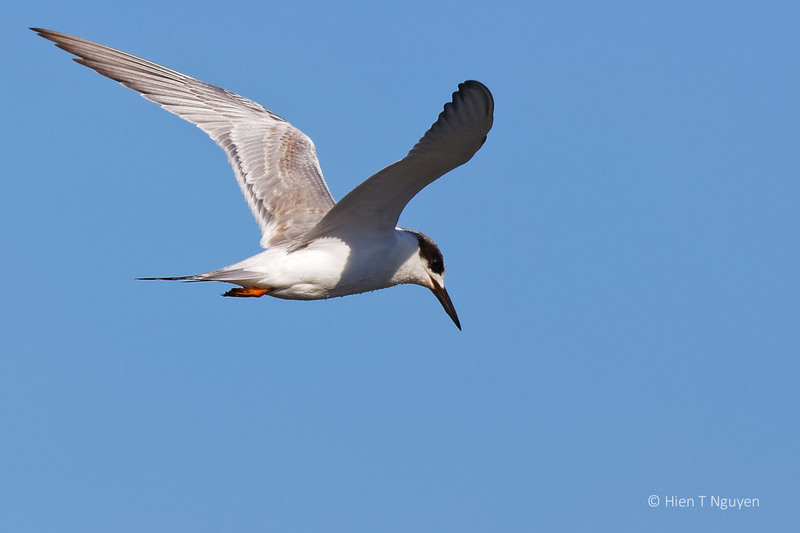 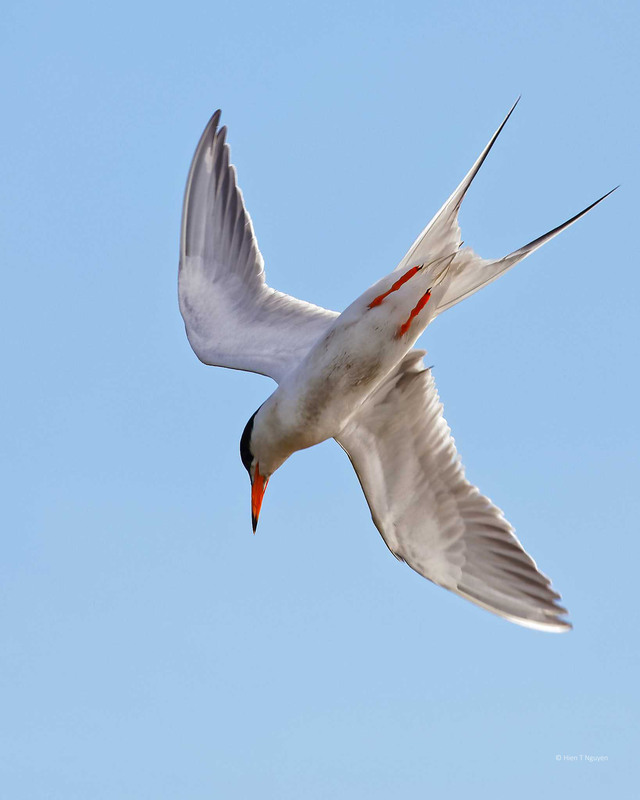 They were made by dozens of Forster’s Terns as they dove into the water to catch small fish. 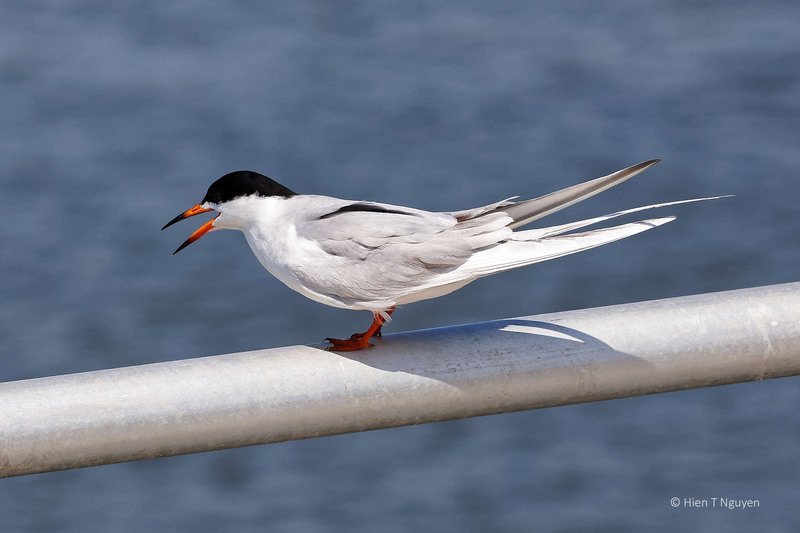 The Terns were amazingly energetic and fast, perhaps not to the level of Peregrine Falcons, but still way too fast for me. 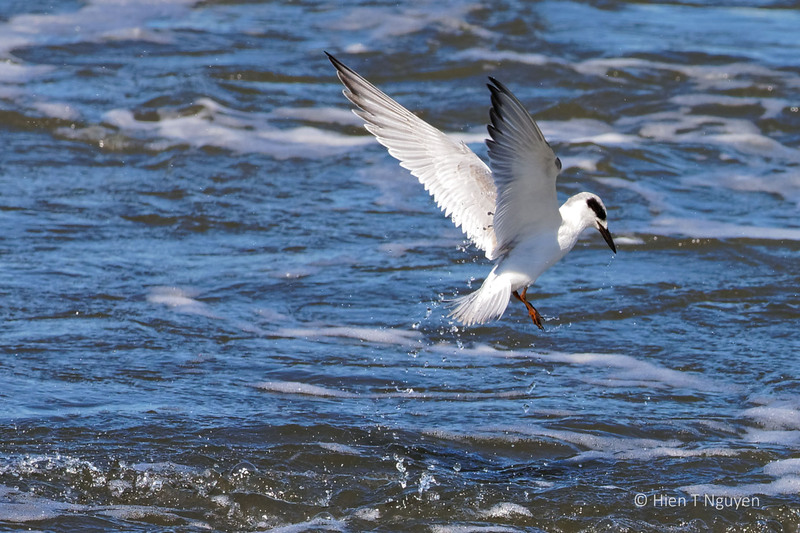 By the time I heard a splash sound, they were already in and out of the water, climbing toward the sky. 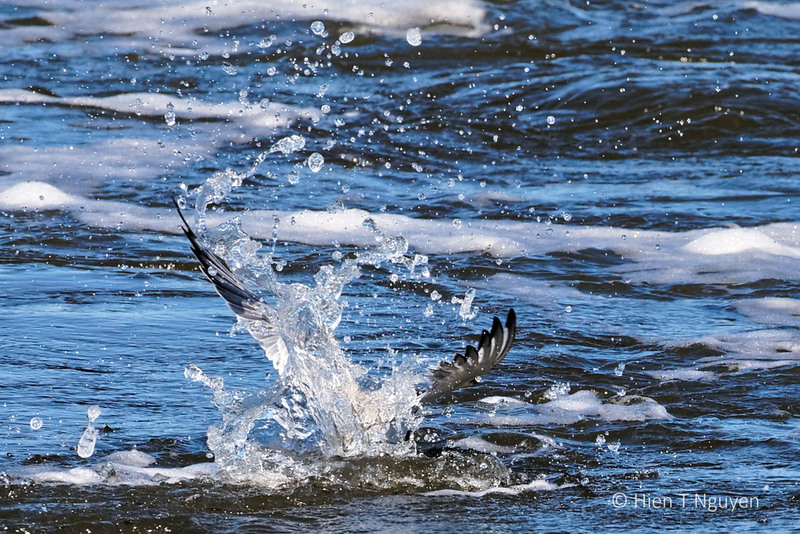 I tried to photograph them diving but found that I missed them practically all the time. 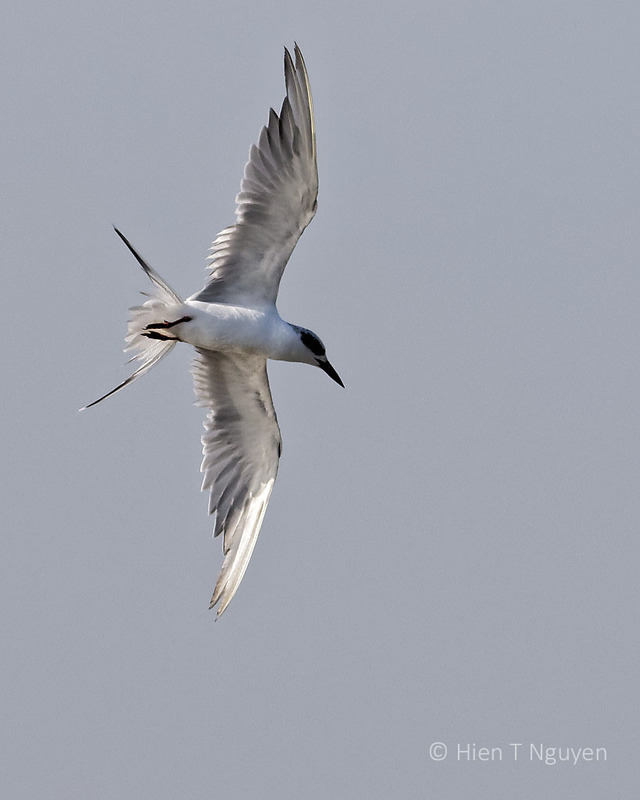 Finally, I stopped following them with my camera as they were flying around, and aimed it at an an area of a pond where many Terns were diving, and then waited. 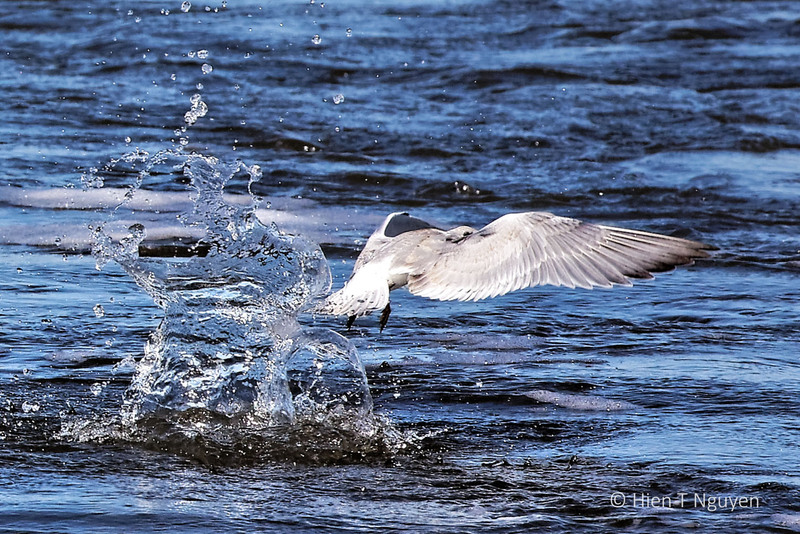 As soon as I heard a splash, I clicked on the shutter. 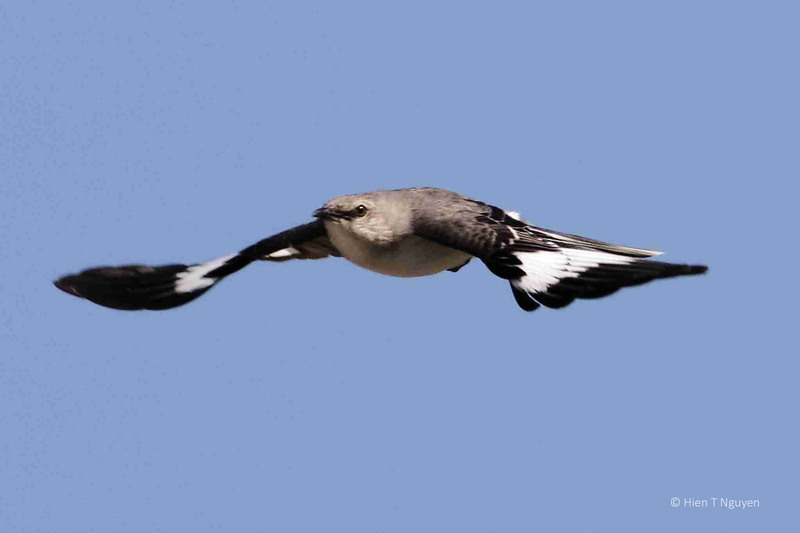 The images shown below are combined from two passes around Wildlife Drive. 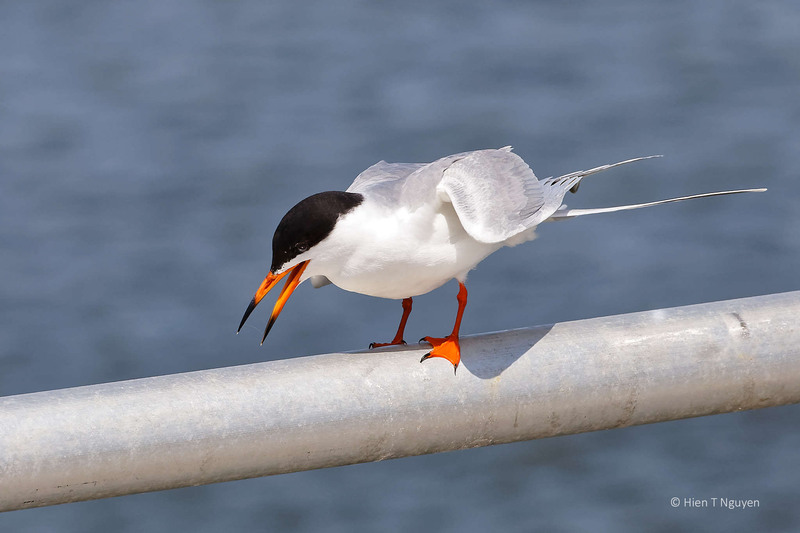 Forster’s Tern looking for food. 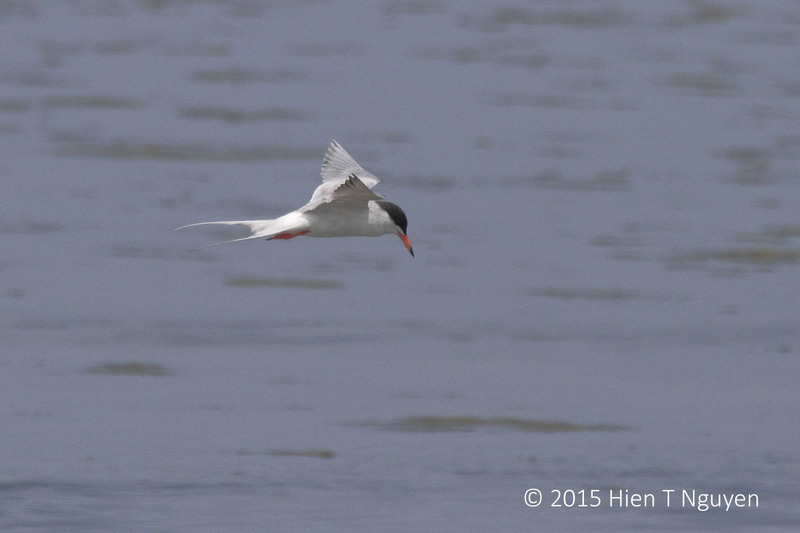 The following photo is not sharp, but the Tern’s speed left me no time to react and focus properly. 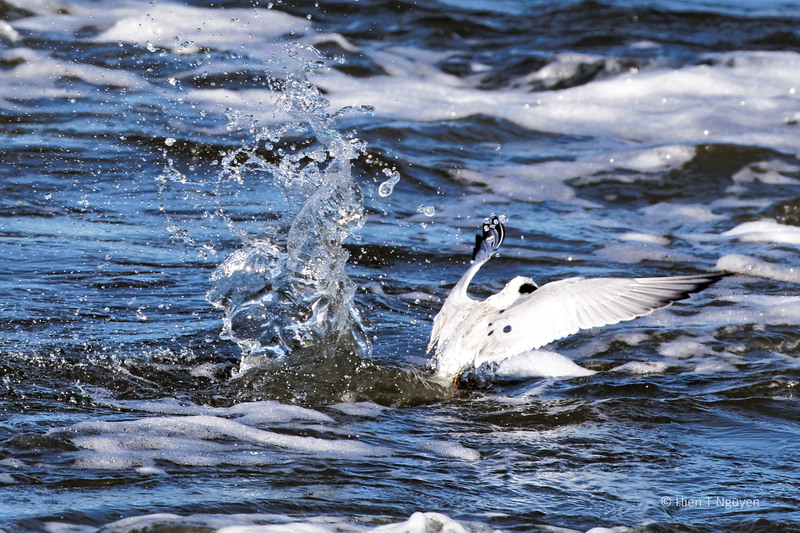 Forster’s Tern coming out of dive. 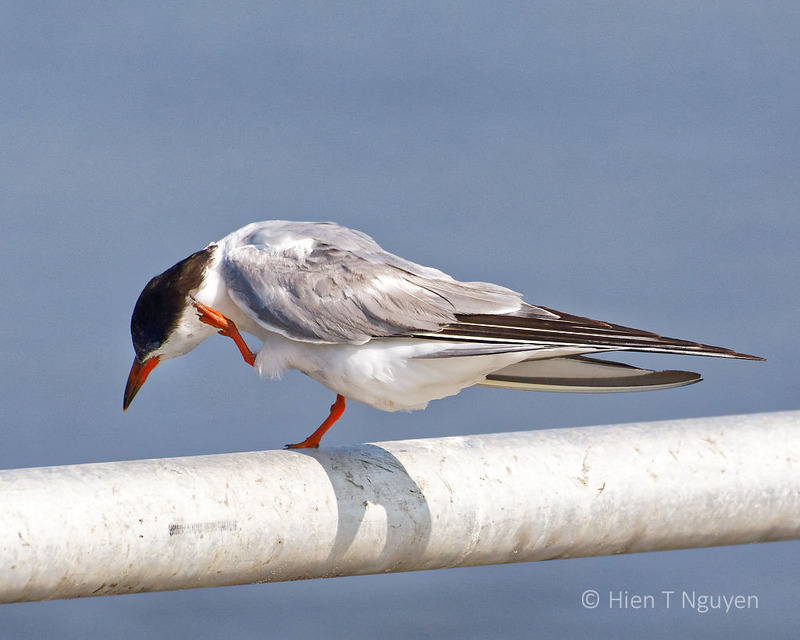 Forster’s Tern out of water. 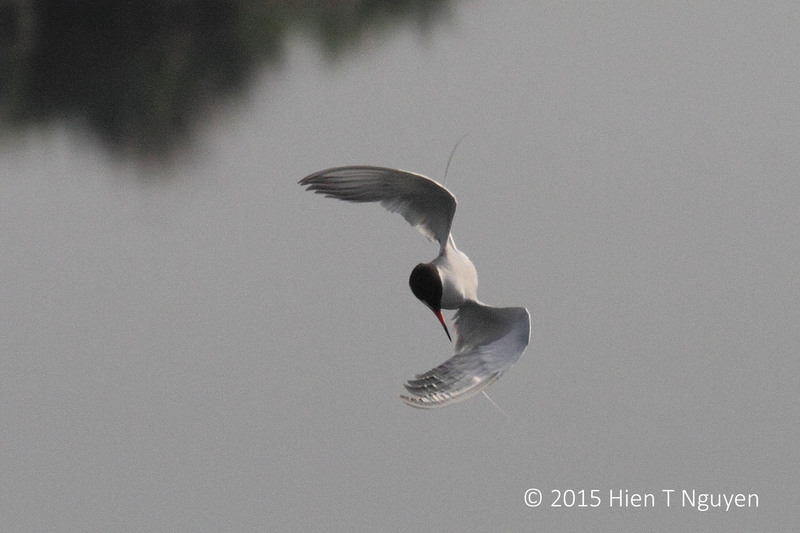 Forster’s Tern emerging from dive. 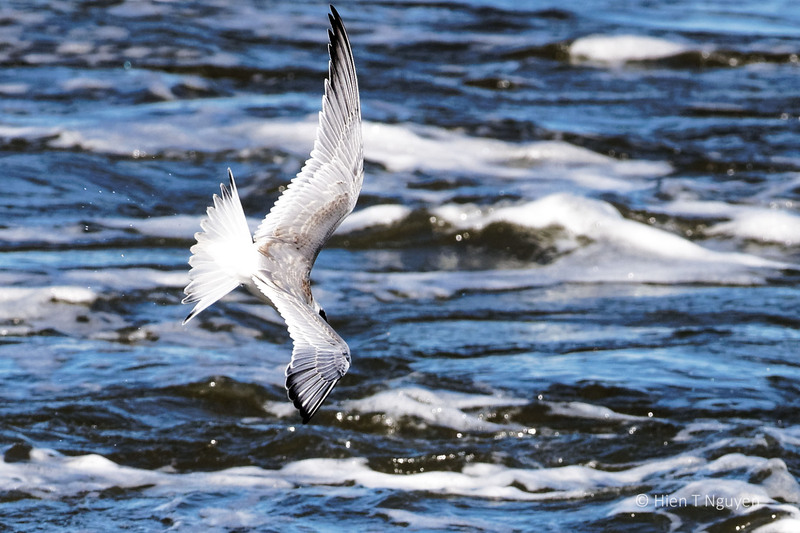 I took this picture two months ago. 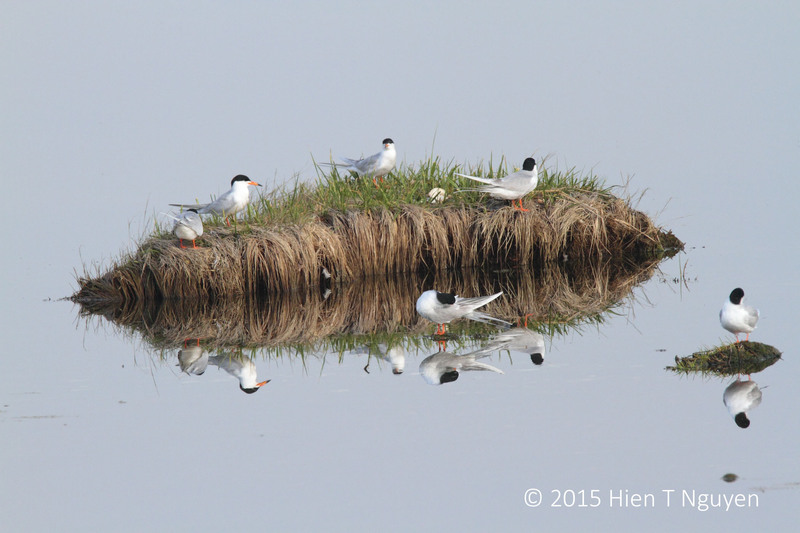 It shows a group of Forster’s Terns on a tiny island in the marshes at the Edwin B Forsythe National Wildlife Refuge. 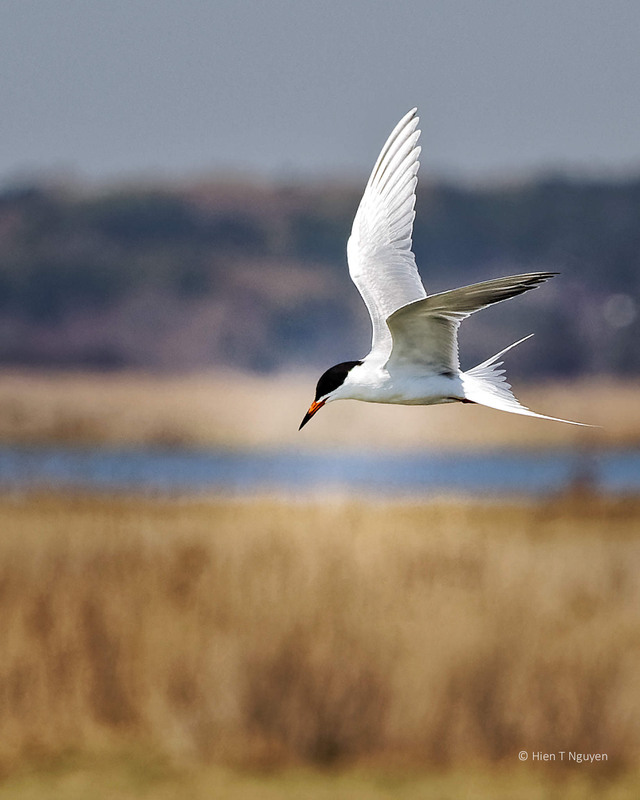 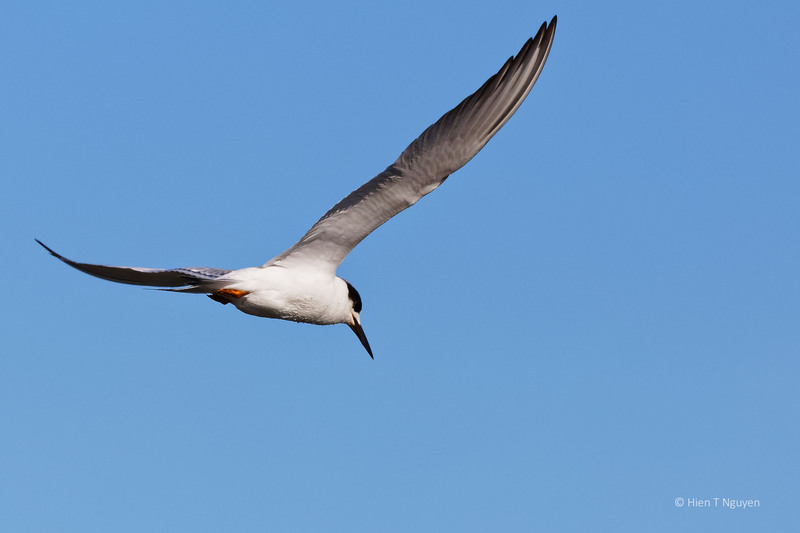 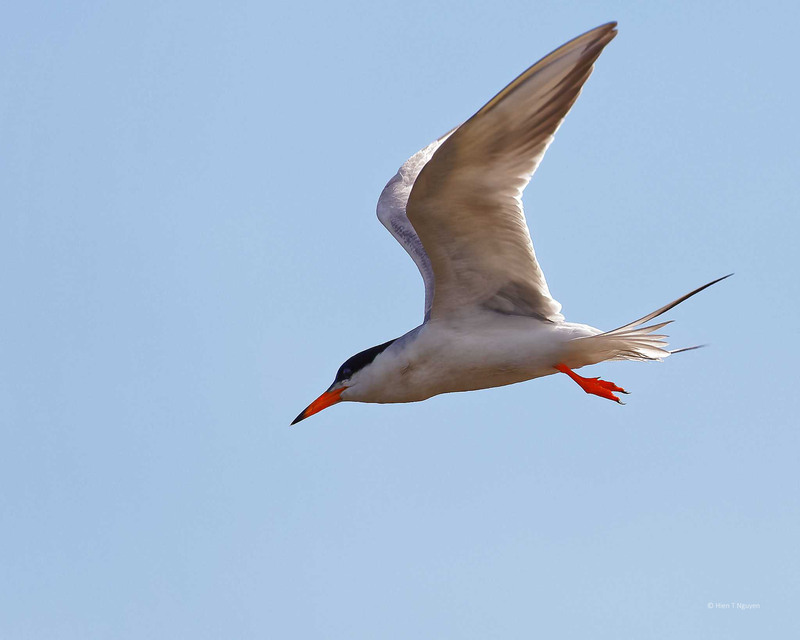 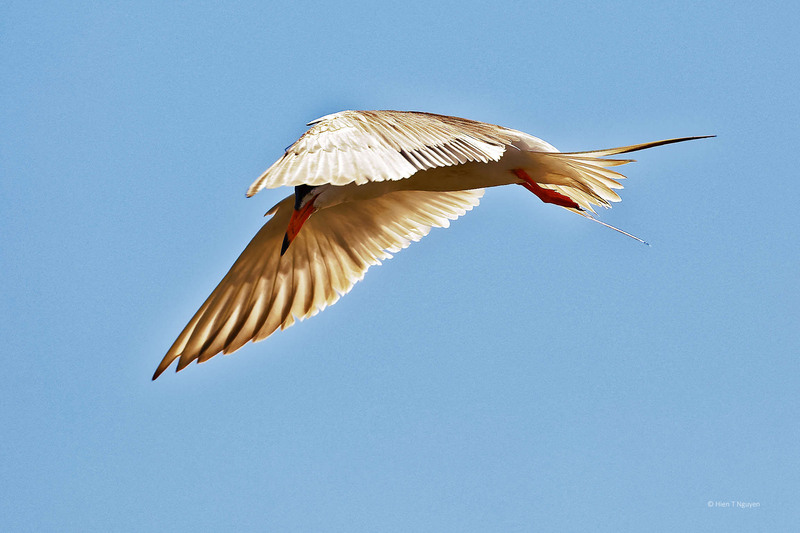 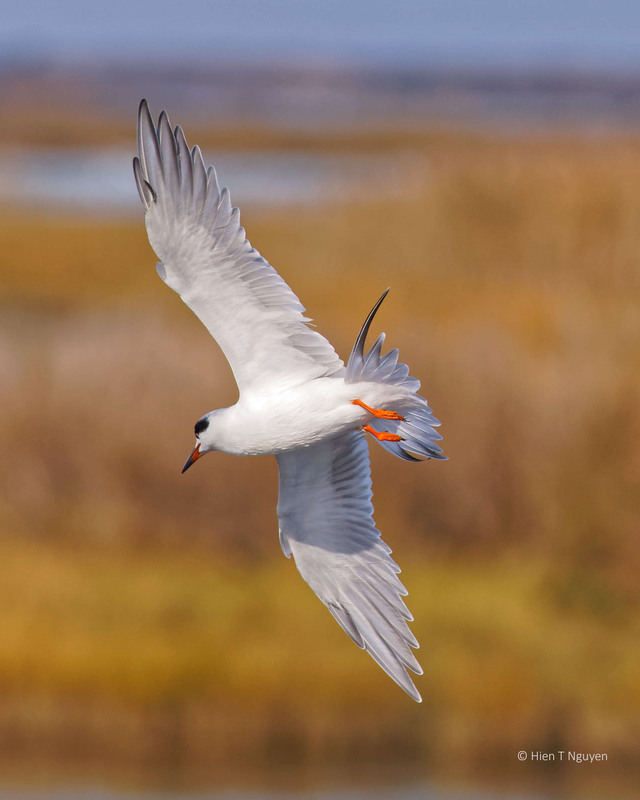 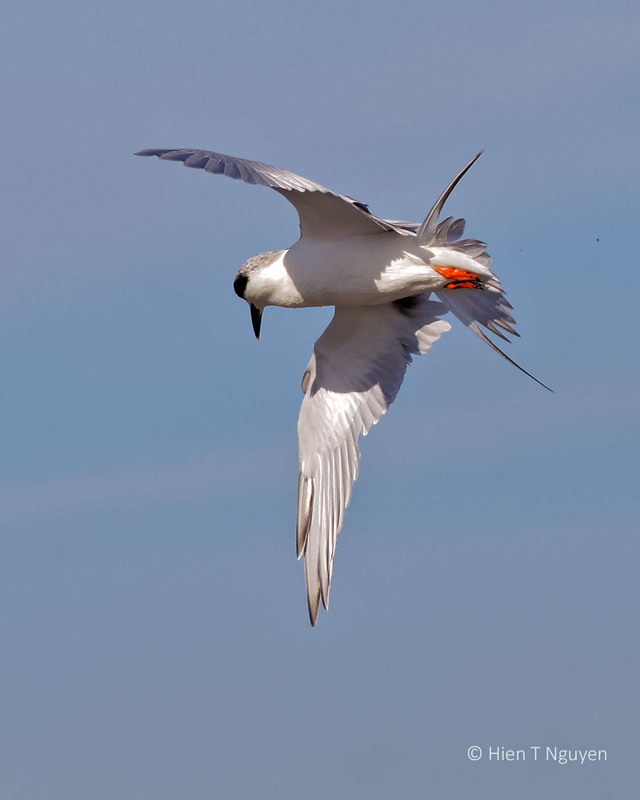 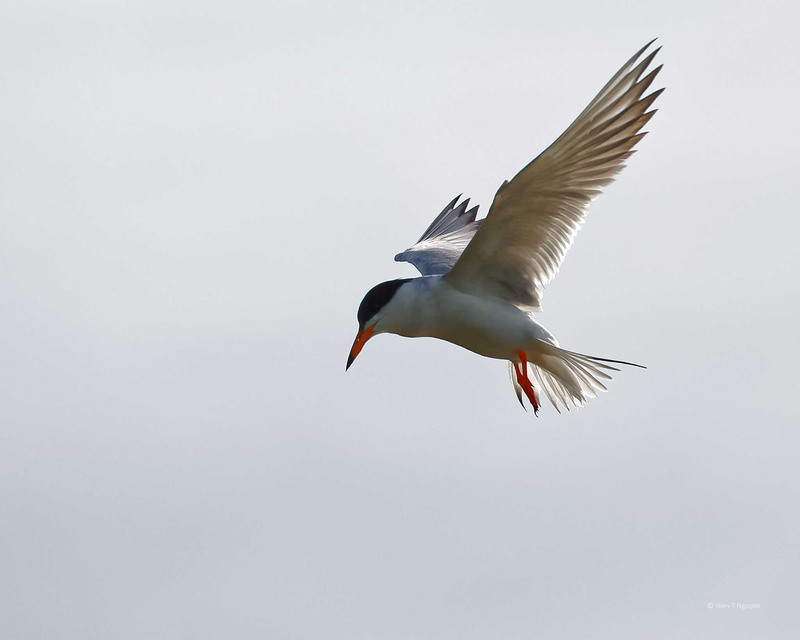 As they hunt for food, Forster’s Terns like to hover over the salt marshes at Edwin B Forsythe National Wildlife Refuge. 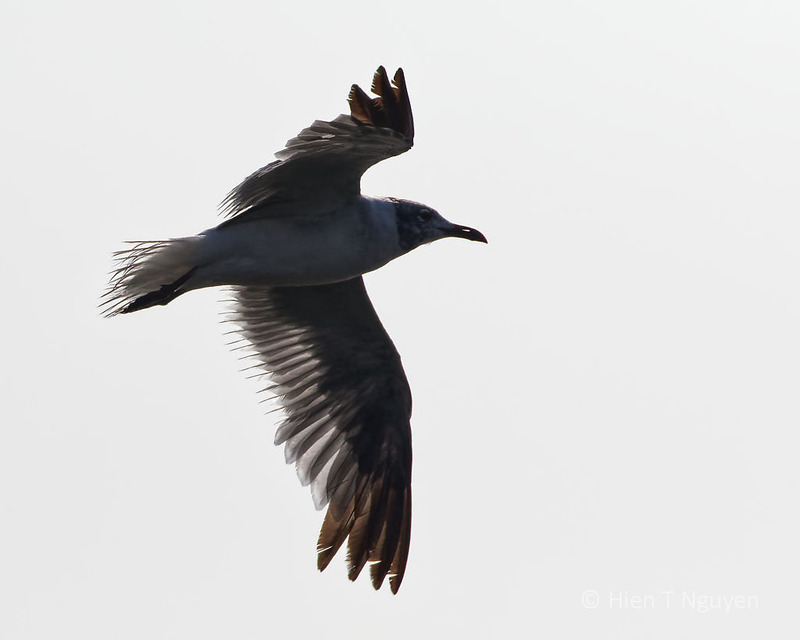 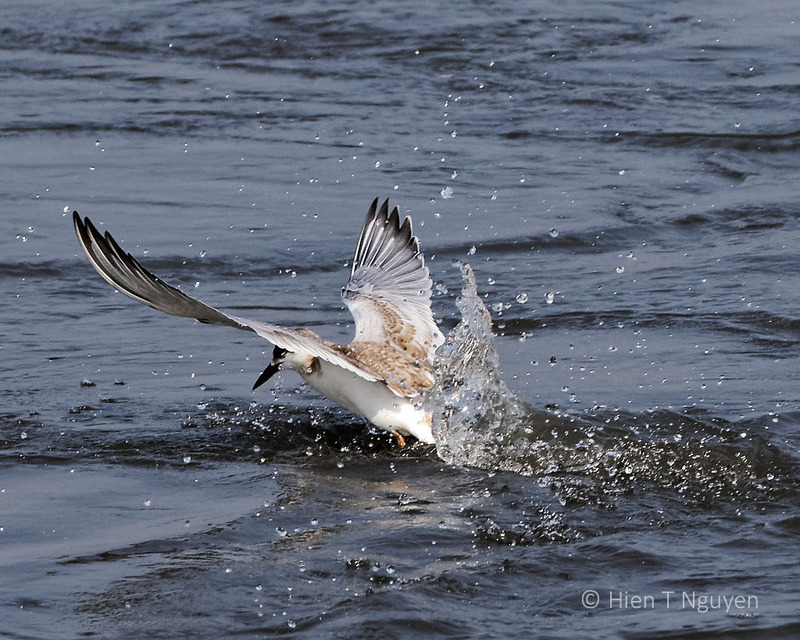 They fly in small loops and dive into the water at fairly high speed to catch some fish, not always successfully. 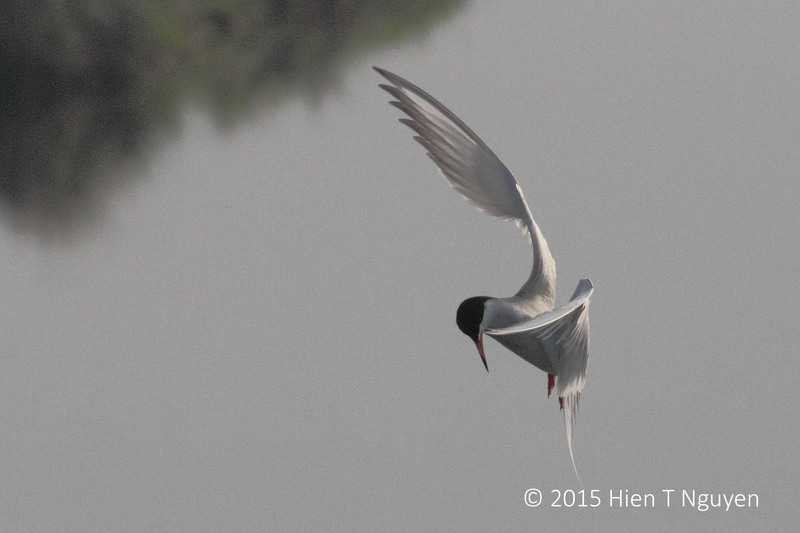 This makes them somewhat difficult to photograph, and I’ve tried to do that many times. 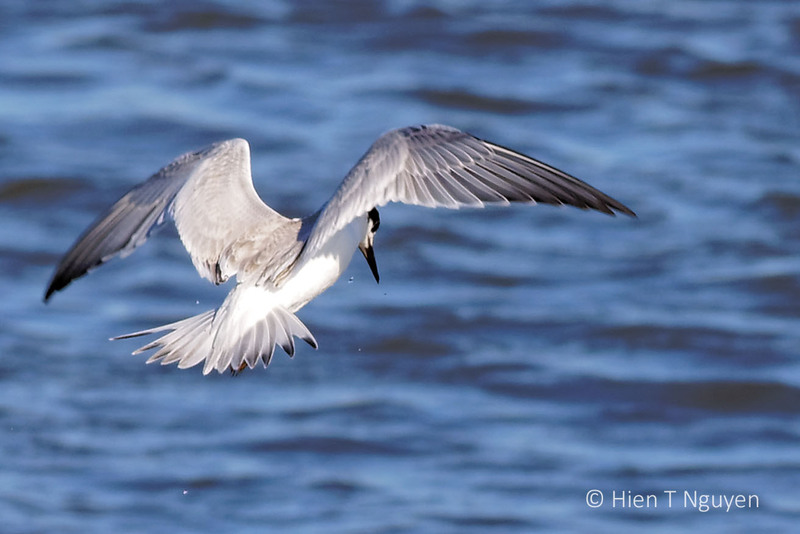 It’s only a few days ago that I was able to get some shots where a tern has actually caught a meal. 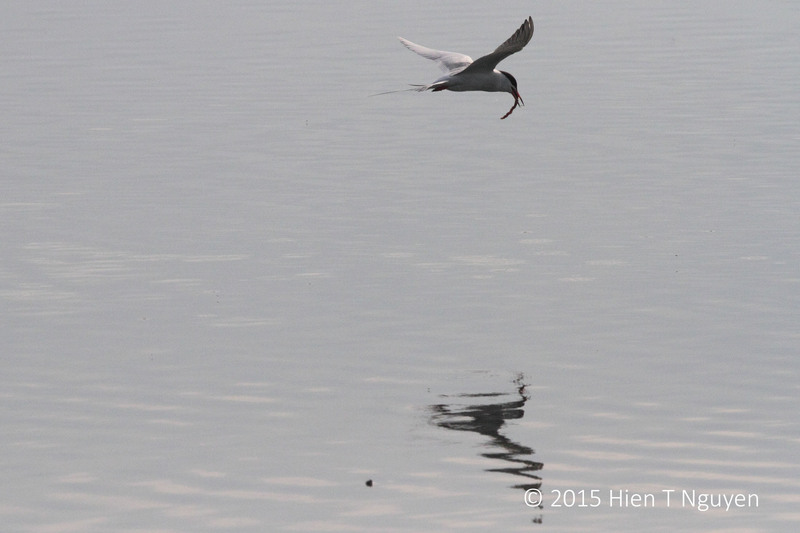 Forster’s Tern catching a fish. 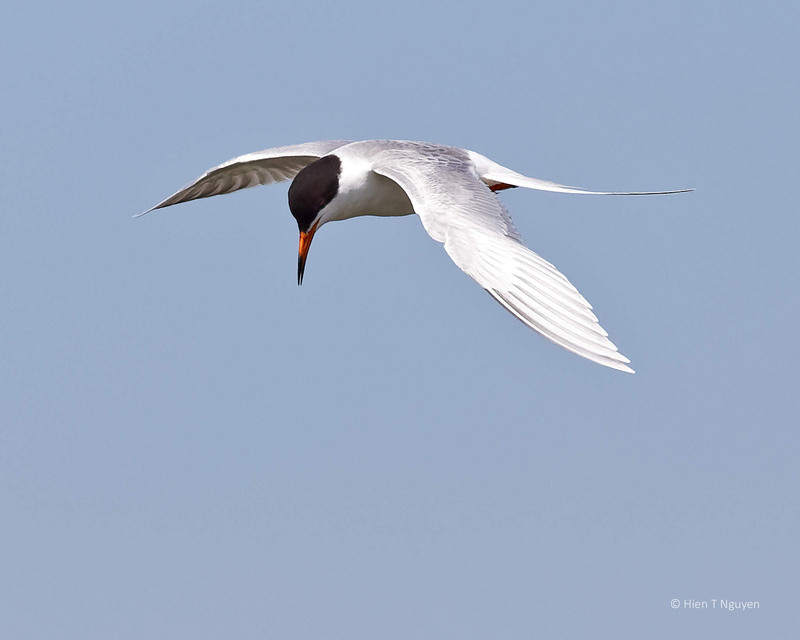 Forster’s Tern hovering like a bomber.